Take your co-workers, friends or family out for a well-crafted drink. It’s a great way to unwind after a long work week and an awesome way to kick off a weekend. From the ultra-unique to the time-tested classics, find all your favorites at the 10 best cocktail bars in Indiana. Perhaps one of the best places in Indianapolis to get a great cocktail is the Bluebeard located on Virginia Avenue, named after the infamous, one and only Kurt Vonnegut, a native of Indianapolis. The Bluebeard arose out of a need for a bakery that made hearth-baked, European style bread and since 2002, the restaurant has developed and crafted delicious dishes and classically unique cocktails, such as the Road to Nowhere and the Garden of Eaton. Located in the heart of downtown Kokomo on the second floor just above the Wildcat is the Coterie, where locals and visitors alike can, at least for a while, escape the ordinary and enjoy the extraordinary. Be sure to try one of their classic cocktails such as the Junglebird or the Lions Tail, or one of their signature cocktails including the Pineapple Hi-Fi or the Ms. Foster. The Cardinal Spirits in southern Bloomington, Indiana was created out of a shared passion for American manufacturing and craft spirits, and it’s a place that values entrepreneurial thinking and creativity. It’s a place where connections are formed, conversations are had, and communication is increased. Enjoy their delicious fall themed cocktails such as the Not Your Grandma’s Eggnog or the Mr. Pitiful, or a spirited brunch cocktail, including the Hot Hopscotch and Little Miss Sunshine. The best place for a great cocktail in Carmel is the ever-popular Kona Grill, which features a unique combination of upscale American cuisine made from scratch, award-winning sushi and a bar that keeps the customers coming back. It’s a little slice of Hawaii in the Midwest with a giant selection of cocktails to choose from, including a vintage Manhattan, the Red Sangria or their signature Kona Mai Tai, featuring Cruzan coconut rum, amaretto, orange, lime, pineapple and togarashi. Nicky Blaine’s is Indianapolis’s original “retro bar,” offering a unique experience to those looking for an intimate evening or the perfect atmosphere for a night out on the town. 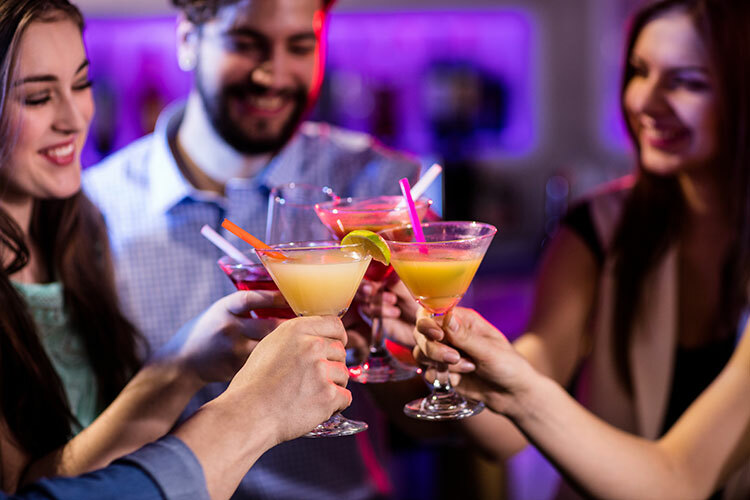 It’s the place where unlike most bars and nightclubs, you can actually hear yourself talking and having a great time with friends, family, and colleagues. In addition to their classic cocktails such as the Kennedy’s 109 or Salty Dog, the lounge also features a cigar sommelier who is more than happy to share their cigar expertise. Open only during the warm weather months is the Bridges Waterside Grill in northern Michigan City. The Grill is just ten minutes from Dunes National Lakeshore and less than a mile from the public beach at Washington Park. The Grill gets its name from the four surrounding bridges, and features a fun, casual, relaxed ‘beachy’ atmosphere – and cocktails to match! Enjoy a delicious Ba ‘Silly’ Ness, Shiver Me Gingers, or the deliciously tropical Rum Job. Come for the experience, stay for the music, the food and the drinks! Bokeh Lounge features live music and entertainment, and a wide assortment of cocktails to accompany. Choose from the classy Pink Caddy, the Alabama Slammer or the Melon Ball, and be sure to pair one of these delicious drinks with the Chickpea Salad and the BYOB(urger). Inside of St. Elmo’s Steakhouse is the 1933 Lounge, located in downtown Indianapolis near the heart of the city. Visitors and locals alike not only come for the food, but they also come for the signature ‘Elmo Cola’ cocktail which features Maker’s Mark Bourbon, Italian Luxardo cherries, and Madagascar vanilla beans served with an actual glass bottle of Coke. Other cocktails include Pop’s Old Fashioned and The Whippersnapper. Old world and rustic Mediterranean cuisine at its finest is what you’ll find here at the Black Market in Indianapolis. The food and drinks are a combination of places like Rome, Sicily, Madrid, and Paris. Here you can travel without ever leaving your seat as you dive into the deliciousness that is the Black Market. In addition to great food, one will also find a wide assortment of incredible cocktails including the Ron Forrest Rhum, Lieutenant Duderino, and the Blood and Sand cocktail.